This weekend is filled with activities for all ages. City wide garage sale, Sidewalk sales, Golf Tourn., Food Stands, Bingo, Pedal tractor pull, Bungee run, Train rides, Horse and trailer rides, Kids money hunt, Arts and craft stands, Live Music, Grand Parade and Fireworks. 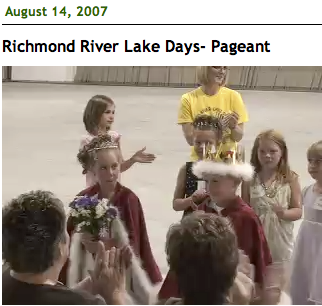 Click here to view the 2007 River Lake Days brochure in pdf format.